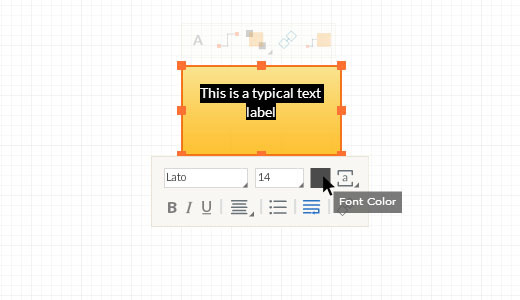 There are essentially 2 ways to add Text to your diagrams. 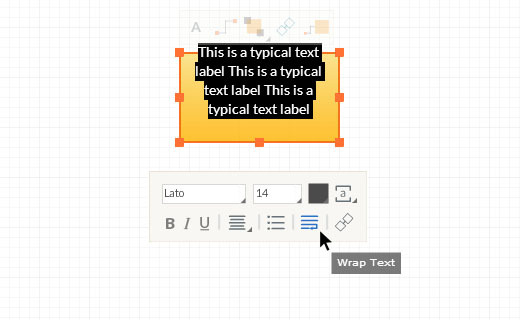 You can add text to any object using the Edit Text button from the object's contextual toolbar. 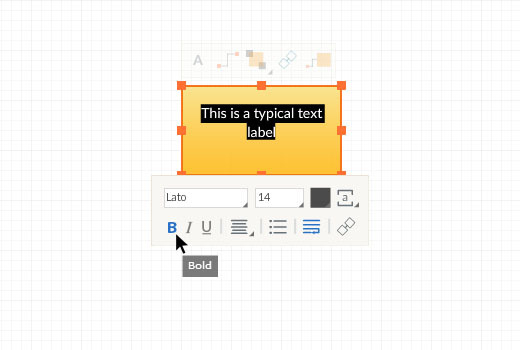 This will reveal the Text Edit toolbar, and you can simply start typing. 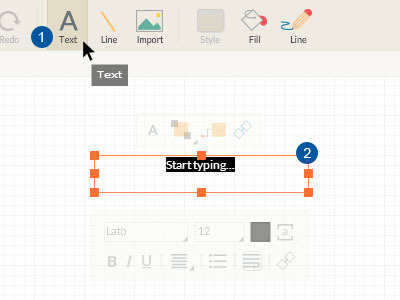 Click on the Text Element Button (from the Main Toolbar) and click anywhere on the drawing canvas to start typing. When you're done, hit the TAB key to commit your Text or ESC to Cancel. The Text Edit Toolbar appears under your Text each time you enter the Text Edit mode. This is where you can format text, position text elements, add hyperlinks, etc. 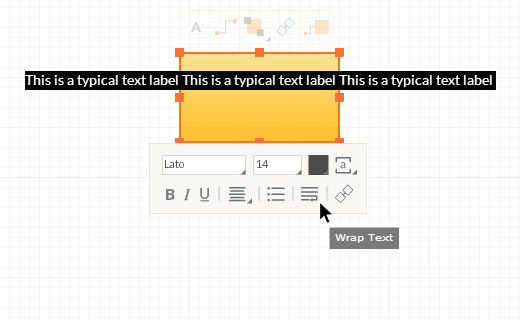 We love our contextual Text Edit toolbar and we hope you enjoy using it. 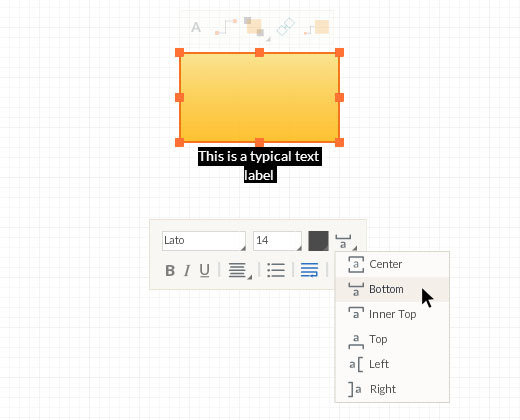 Here's a button-by-button run down of the Text Edit Toolbar. The first two fields of the first row lets you set the font type and the font size. We currently support a fine list of open fonts. The third button of the first row lets you set a text color. Click on the button and select a color from the color palette that appears. The final button in the top row is the text position button. 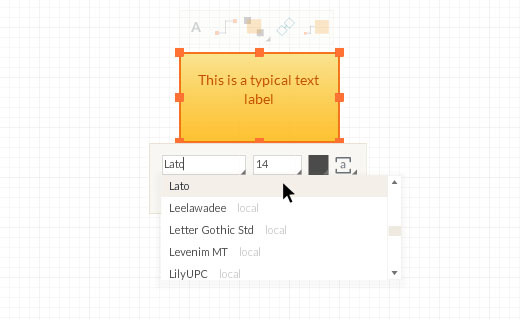 Use it to set the relative position of the text field to its parent shape. The first few buttons in the bottom row lets you add more text styles. Use them bold, Italic or underline your text. 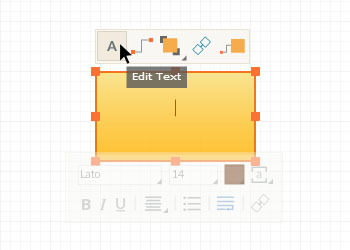 Use the fourth button to align text and the fifth button to add bullet points. 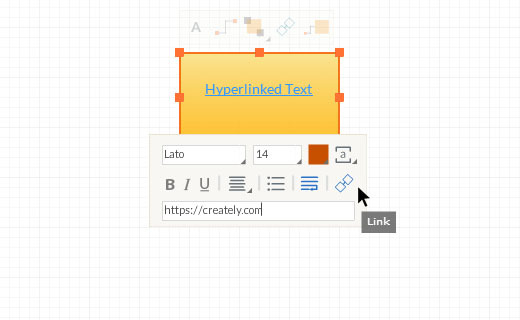 The final text field on the Text Edit Toolbar lets you create hyperlinks to external web locations. This is great for Sitemaps and Wireframe Mockups. Simply enter any web URL (e.g. http://creately.com) to create hyper-linked text and hit TAB to commit your change.